Percheron offers several packages for Single Medium / Large TV Ceiling Mounting. All of the packages come with the Percheron PR-CPL2F Large Ceiling Mounting Plate along with the Percheron PR-S730T Single TV Ceiling Mount. Depending on the package selected, we offer different extension pipes and couplings. Medium / Large Flat Panel TV Ceiling Mount, 12 inch Drop. Complete kit includes Ceiling Mount, Extension Pipe, Mounting Plate, Flat Ceiling Plate. Medium / Large Flat Panel TV Ceiling Mount, 24" Drop. 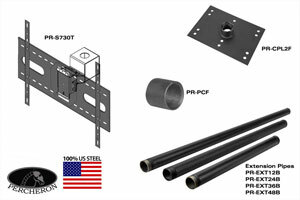 Complete kit includes Ceiling Mount, Extension Pipe, Mounting Plate, Flat Ceiling Plate. Medium / Large Flat Panel TV Ceiling Mount, 36" Drop. Complete kit includes Ceiling Mount, Extension Pipe, Mounting Plate, Flat Ceiling Plate. Medium / Large Flat Panel TV Ceiling Mount, 36" Drop. Complete kit includes Ceiling Mount, Two Extension Pipes, Mounting Plate, Flat Ceiling Plate and Coupling.